Star clusters are among the favorite deep sky objects for amateur telescopes. Many are listed in Charles Messier’s famed catalog and fall into two main types, open clusters and globular clusters. Open clusters usually contain only a few hundred stars; some are often very young, having formed within a few hundred million years. 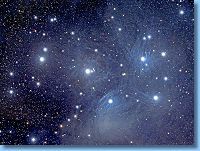 M-45 the Pleiades is one of the best examples of this type of cluster. It’s easily visible to the naked eye and contains very hot and luminous stars. On the other hand, M-67, another prominent member of Messier’s catalog, is one of the oldest open clusters and estimated to be over 3 billion years old. Over time the stars in open clusters are likely to drift apart and disperse within our galaxy. 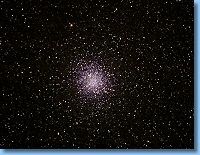 Globular clusters are tight groups of hundreds of thousands, even millions of mainly old stars. They are roughly spherical in shape, and 10 to 30 light years across. M-3, 5, 13 and 22 are among the most prominent globulars in the northern hemisphere, along with Omega Centauri and 47 Tucanae in the southern hemisphere. The latter are enormous clusters containing millions of stars. All are splendid objects in amateur telescopes. They are distributed in a roughly circular halo around our galaxy and orbit it in highly elliptical trajectories. Unlike open clusters, globulars are mainly populated by very old stars, many just slightly younger than the 13.7 billion years of the universe itself. There is evidence that at least some globular clusters are the remnants of smaller galaxies that have merged with ours. The Milky Way contains about 150 globular clusters, while some giant galaxies, like M-87 contain thousands.